In a time-crunched world, you often have to combine work and pleasure. The refined Galaxy Tab S4 is your ultimate entertainment and multitasking assistant. Use the built in DeX Mode for ultimate productivity. DeX Mode lets you seamlessly switch from tablet mode to a PC-like experience – it’s so intuitive that when the keyboard is attached, it automatically switches to the mode that best suits your need. *HDMI adapter, keyboard, and monitor sold separately. Microsoft Office requires users to purchase licenses. Samsung DeX supports multi-resolution (HD+/FHD) video outputs. HDMI adapter required to connect to external display using Samsung DeX. Some apps in tablet mode may differ when in Samsung DeX mode. Recommend accessories for Galaxy Tab S4: Multi Port Adapter (EE-P5000B), HDMI Adapter (EE-HG950), DeX Cable (EE-I3100). Exact model number may vary by country. Galaxy Tab S4 works like a desktop. View multiple windows at one time, drag and drop content between apps and enjoy your favourite content in full screen mode for easier multi-tasking and enhanced productivity. *Keyboard, mouse sold separately. Some apps in tablet mode may differ when in Samsung DeX mode. Drag & drop currently supported in Messages, Myfiles, Samsung Notes, Gallery, e-mail, and Gmail only. Your personal productivity relies on comfort. That’s where Samsung DeX with an external monitor comes in. Easily share your screen, project videos through the screen mirroring functionality, or use the Dual Mode to connect your tablet to your monitor and use your tablet as a touchpad. *HDMI adapter, monitor sold separately. Samsung DeX supports multi-resolution (HD+/FHD) video outputs. HDMI adapter required to connect to external display using Samsung DeX. Some apps in tablet mode may differ when in Samsung DeX mode. Recommend accessories for Galaxy Tab S4: Multi Port Adapter (EE-P5000B), HDMI Adapter (EE-HG950), DeX Cable (EE-I3100). Exact model number may vary by country. When you aren't using your Tab S4, the POGO stand creates a home concierge experience. * With the Screen-Off Memo feature, you can jot down quick memos even when the screen is black, using the Enhanced S Pen1. Enjoy accurate writing and drawing with the enhanced S Pen*, which comes included with the Tab S4. The S Pen is lighter and easy to use, optimized for comfort even while using it for a long period of time. With no charging needed, you can write for as long as you like – without even having to unlock your tablet. Create handwritten notes, GIF images and emojis that further capture your inspiration, or use the S Pen to drag and drop content from one application to another. The enhanced S Pen and Air Command can translate words and phrases instantly. Simply hover over the text for easy translation. *POGO stand sold separately. 1Enhanced compared to previous releases of the S Pen. 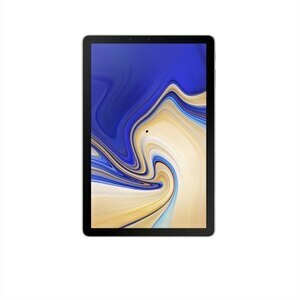 The Galaxy Tab S4 offers an exceptional screen-to-body ratio with its 10.5" display and 16:10 screen ratio and Super AMOLED display. Enjoy an immersive viewing experience when watching your favourite content. *Dolby Atmos effect is also supported through Bluetooth speakers and earbuds. The Galaxy Tab S4 has a battery capacity of 7,300mAh lasting for up to 16 hours of video playback, so watching your favorite shows or season is now possible. And if your battery does run out, bring it to a full charge in just 200 minutes with fast charging. *Charging time vary depending on environment and charging device. Battery life is subject to several factors, including location, signal strength, feature configuration and usage. Actual results may vary. When you aren't using your Tab S4, the POGO stand creates a home concierge experience, displaying your calendar, news reports, entertainment hub and home controls – enabling a convenient and seamless home experience. *Weather forecast feature requires a data connection. POGO stand sold separately. Daily board use requires POGO charging dock or Type C USB. With Bixby Vision, look up information right from your camera. Shop for an item you see in a store window, identify landmarks and businesses on the spot, and even translate foreign language signs and menus using the Bixby Vision icon in the camera viewfinder. *GPS must be enabled to use Bixby Live Result. Available functions and features may vary by country. Galaxy Tab S4 now includes iris scanning in addition to face recognition technology. A quick scan of your face or eyes is all that is needed to unlock your device. You can even help protect private files and apps with defense-grade encryption security using bio-authentication together with Secure Folder. Keep your data better protected with Samsung Knox. The defense-grade security platform is built from the chip up. Multiple layers of real-time security put your data in a secure folder that only you can open, allowing you to easily keep your work and personal documents separate. Images are for illustration purposes only and the accessories are sold separately. Features and Specifications are accurate as of commercial launch but may be subject to change without prior notification. Explore, work and watch your favorite shows on a clear and stunningly brilliant screen. Transform your Galaxy Tab S4 into the PC experience with the taskbar you're used to with the DeX. Create a PowerPoint presentation and revise budgets in Excel at your favorite café. Then edit, sketch and capture inspiration with the included S Pen. And using far field mics, you can even control your Tab S4 from a distance with Google Assistant.